A special thanks to staff and governors that met with Andrea and staff that have been part of the working party. Thank you to all the parents who sent in the questionnaires. 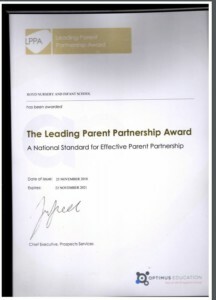 LPPA is an exciting national award that will help us to improve our strategies to involve parents and carers more fully in every child’s learning experience. One of the principle criteria of the award is the promotion of and participation in lifelong learning within the school for parents and carers. It is vital that parents and carers understand and support their child’s learning and development. Family learning can reinforce their relationships with their child and the school as well as developing their own skills and knowledge. The LPPA offers long term benefits such as improved pupil attendance and behaviour and increased parental involvement and support. We hope to continue to improve communication between school and home and nurture the child/parent relationships by highlighting the benefits of adult learning and the positive impact this can have on a child’s education. This is a challenging but rewarding venture. It is easier for a child to learn when they get encouragement at home. They will do better and achieve more when their parents or carers are involved. Their concerns can be sorted out more quickly when parents and carers have a positive relationship with school staff. They are happier when their parents or other family members get involved in the school. It shows them that you are interested in what the school, is doing. Allows them to see that you value what they are learning. Gives them a sense of security. Helps them to learn about good citizenship from your example. Your children do better when you are involved. You are better able to help and encourage your children. You get to know the teachers and other parents. You also gain a better understanding of how the school works. Get to see how your child relates to other children and their teachers. Have the satisfaction of knowing that you are making a contribution to the school and your child’s learning. If you have any suggestions for how parents and carers and Royd Nursery Infant School can be involved together more fully in your child’s learning experiences, please get in touch. Many thanks to all of the parents and carers who recently attended our Family Learning Course: Fun with Letters and Sounds. Keep watching this space for details of more courses.